In this section I will consider just the basics of data processing before describing how to determine the purity. 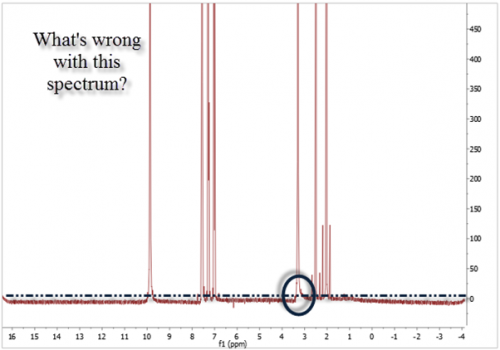 If you do this step carefully you will also have a chance to look closely at the data and satisfy yourself whether or not the spectrum quality is adequate for qNMR. Note that you always want to increase the vertical scaling significantly to see the nitty gritty of your data! Mnova reports the â€œAverage T2*â€ at the top: 0.300 s in this case. 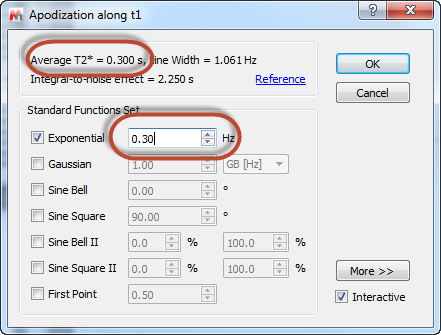 What we need to do is (a) check the box to ensure Exponential multiplication is used, and (b) enter the same 0.30 Average T2* as the Hz value. When you click on â€œOKâ€, this Apodisation will be applied and the spectrum automatically updated. 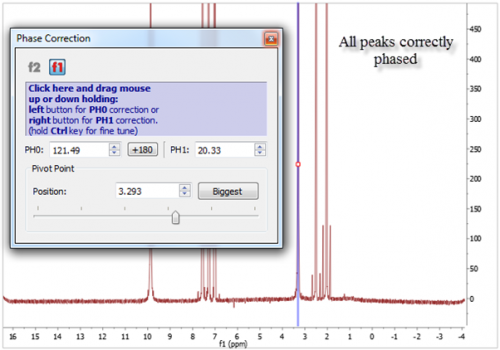 Mnova will usually import the phase values saved by the spectrometer. If these are hideously incorrect you can use AutoPhase (Processing > Phase Correction > Automatic). But we need the phase to be correct to 0.1Â°, and you will almost always have to perform a manual phase correction (Processing ? Phase Correction ? Manual Phase Correction). The blue vertical line shows the tallest peak â€“ which is where the PH0 will be applied. Whilst looking at the base of this peak, place the mouse cursor on the blue pad and drag the mouse whilst holding down the left mouse button. Hold down the â€˜Ctrlâ€™ key whilst dragging the mouse to make finer adjustments. 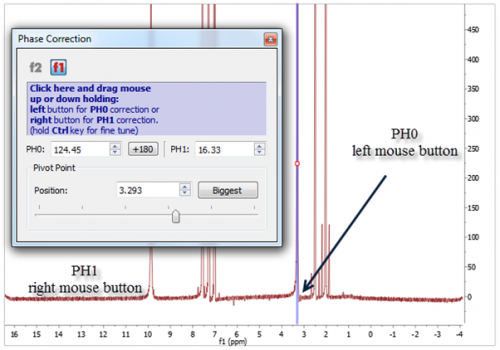 Once the biggest line is correctly phased, repeat this process whilst holding down the right mouse button: the other peaks should be phased. It may not be terribly obvious that the baseline needs correction. In the spectrum, below, the lower trace (A) shows one common symptom of poor baseline, here evidenced in the â€œslopeâ€ the integrals â€“ shown with a blue arrow. 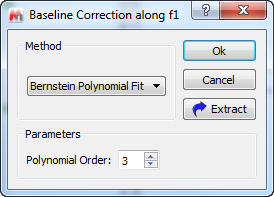 Note that there are more sophisticated baseline correction routines available to you, such as the Whittaker Smoother. This must be used with care as it can play havoc with integrals if used incorrectly. Email me if you want some instruction on using this. In most cases the â€œBernstein Polynomialâ€ will be the best choice. The last task before processing task is to determine the multiplets in the spectrum and the number of nuclides for each multiplet. This is invoked by selecting Analysis > Multiplets Analysis > Automatic, and the analysis will be performed automatically. Follow exactly the same process as above, but be sure to include the structures of the analyte and reference compound. This method is more robust in the determination of the number of nuclides. It is very likely that the procedure you adopt will differ a little from what I have described, and you will likely want to perform tests from time to time to ensure that you and your NMR are doing things correctly. I would therefore suggest that you make a sample of a molecule of high and known purity. Try to use the solvent and internal reference that you use most commonly. The result from this sample will tell you if everything is working well. If you can (and the compound is stable), make perhaps 3 tubes and seal them. This will allow you to check everything from time-to-time. I leave it to you to decide how frequently to do this. 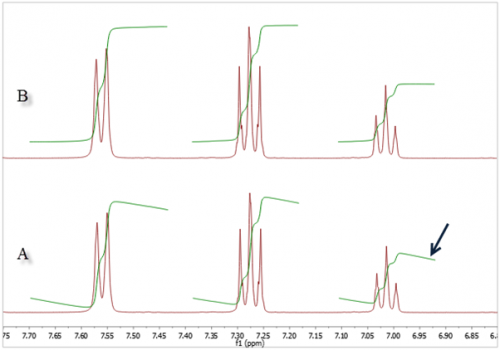 Automated purity analysis supported within Mnova NMR, although currently not in the qNMR engine.